This cozy Studio has a garden view and a small fireplace. 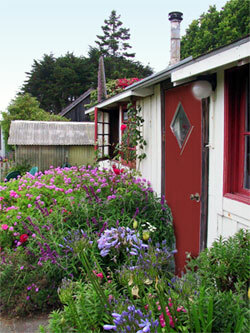 "We've had a very rich Mendocino experience of which this cottage was an integral part. We felt at home almost immediately. Quietest place we've stayed in a long time! Tranquility in a garden of riotous exuberance.Thanks for all the touches that make it special." "Driving up from the Bay Area to get away from the hustle, we made a few discoveries along the way, including this! It was so warm in here, the blankets so thick, I/we had to dig ourselves out in the morning. The sound of the waves crashing against the rocks was great too. Too bad we have to go back home." "Thank you for providing such a comfort haven: I always notice how every single need is anticipated in these simply appointed places. Most especially, the need for beauty everywhere one casts one's eyes." There is a Full size platform bed from which there is a tiny bit of an ocean view. The Studio has interesting woodwork with a wood ceiling, bookcase, table and chairs. The Garden Studio contains a shower, toilet, small sink, small refrigerator, coffee maker, and radio. There are no cooking facilities in the studio.